Protesters occupied a city-based office building that is home to Atos Healthcare, claiming the firm is “victimising” those with specific needs. Banners were strung from the roof of the building and dozens of campaigners entered the office building in Hills Road, Cambridge, pledging to stay overnight. The office was chosen because Atos won a recent Government contract to reassess incapacity benefit claimants and the demonstration was part of UK-wide action. Over a dozen claimants and supporters managed to get our message out about Atos, that ‘They Rob From The Poor To Give To The Rich’ to hundreds of shoppers and people going home from work outside the Atos offices at 45 Gordon Street in the centre of Glasgow between 5pm and 6pm. Banners proclaimed that ‘Atos Are Making The Sick Pay For The Greedy Bankers Debt. 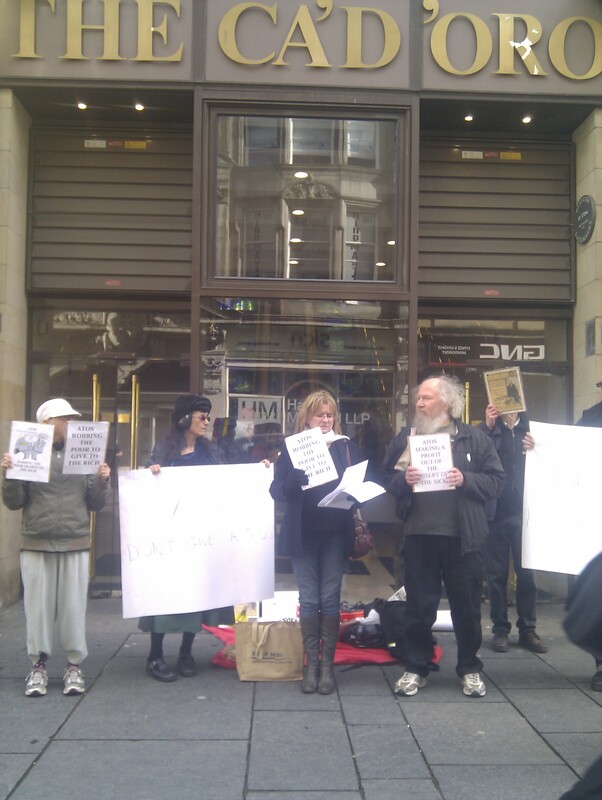 ‘Atos Make A Profit Out Of The Misery Of The Sick’ was screamed out to passersby. 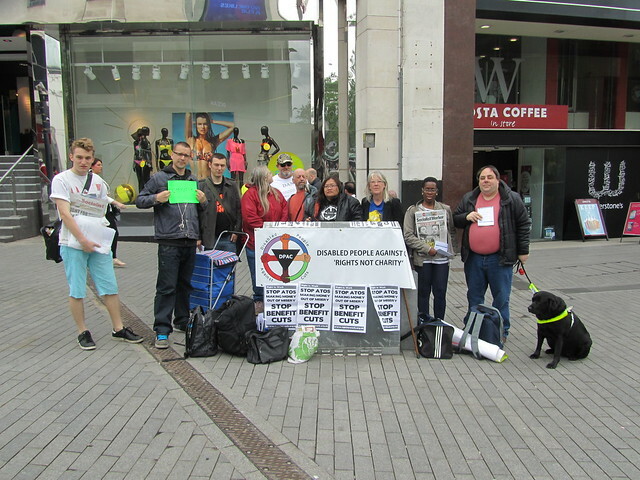 Friday May 13th at noon outside Waterstones bookshop opposite bull statue in Bullring centre DPAC was joined by supporters for leafleting and street theatre ‘ The Computer Says NO’ an adaptation of a Brighton Benefit Campaign play. DPAC co founders Linda Burnip, Eleanor Lisney and Bob Williams-Findlay and supporters were at Birmingham handing out leaflets to interested shoppers and doing an adaptation of ‘The Computer Says No’ . The bystanders /audience were supportive and responded with gusto.Visitors who dropped by to say hello included Birmingham People First and from nearby EHRC regional office.